Peacocks were my inspiration here. I decided to make a trio of cards inspired by this theme. I indulged a little with the gems and sparkle but peacocks are all about the show after all! They didn't take too long to make with the exception of the quilled card. 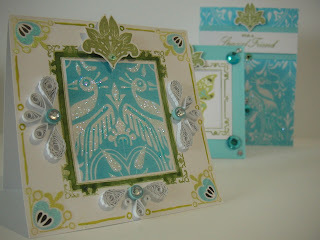 Each card has some similar elements throughout, the gems, the flourish stamp at the top and the colors. The peacock paper comes from an image in a book I have called Victorian Patterns and Designs for Artists and designers. The original was black and white, I scanned it into the computer and changed the colors in Photoshop. The largest card 'For a Special Friend' has the peacock paper over the base. 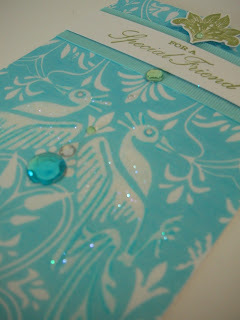 I added two strips of blue grosgrain ribbon to the card, about an inch from the top. On a piece of white card I stamped the sentiment in Tea Leaves Versa Magic Ink. I stamped the flourish from Laurence Llewelyn-Bowen Venaissance in the same color. I cut this out and added it to the top of the card with a foam pad. I picked out the detail of the peacocks and painted over these with PVA, I sprinkled some fine glitter over this. To finish I added some gems. 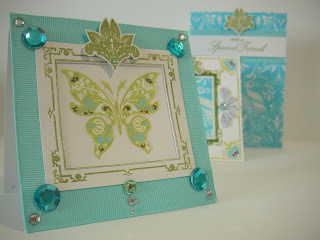 The butterfly card was pretty simple, I made a frame using strips of the same blue ribbon. In the centre I stamped the frame and added the butterfly transfer by Amy Butler. I added the same flourish at the top and added some more gems. The quilled card took a little longer. I started by stamping the frame in the centre and coloring it in with a darker green watercolor paint to highlight it a bit more. In the centre I added a detail of the peacock paper and repeated the procedure above with the glitter dust. Then I added the corners which are transfers by Amy Butler. I extended the design of these a little further using watercolors. 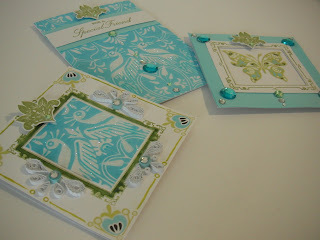 I added the same flourish to the top as with the other cards. I made some quilled teardrops in white and the larger ones are made using crimped quilling paper. I made some blue coils and added these to the design. I added a few gems to finish. Anna Griffin In the Garden, Laurence Llewelyn-Bowen Venaissance.